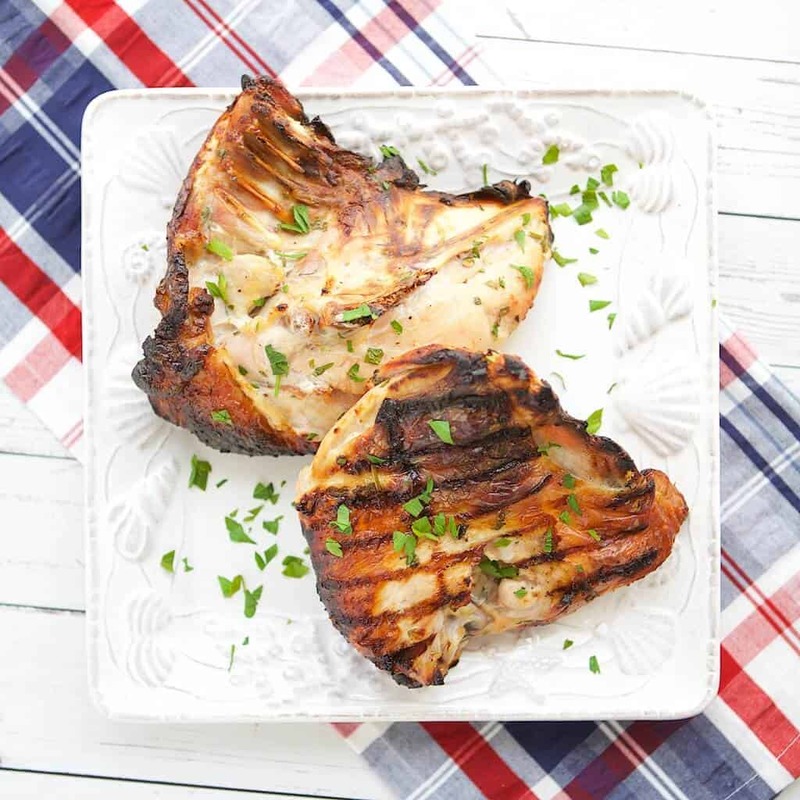 Get out of your grilling rut with this juicy Grilled Turkey Breast recipe perfect for any time of the year. This Grilled Turkey Breast recipe post is sponsored by the National Turkey Federation. Hmmmm… I need something new to happen here. I want big flavor and a crowd pleaser, but I’m bored of the same ol’, same ol’ grilling situation. Turkey?! Did I say, turkey breast? Yes. Yes I did. Turkey, my friends is not just for T-giving nor is it just for meatballs and burgers. 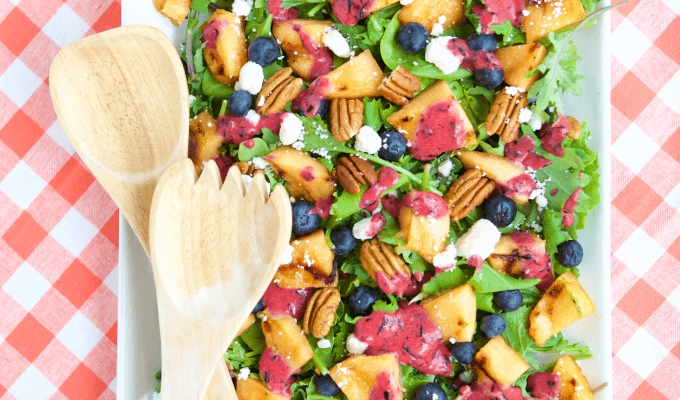 It is for bone-in, super juicy, full of flavor, grilling and it will be a game changer on your grill this summer. Personally, I love turkey. Thanksgiving turkey is one of my favorite things to make and eat, but it happens only once a year. 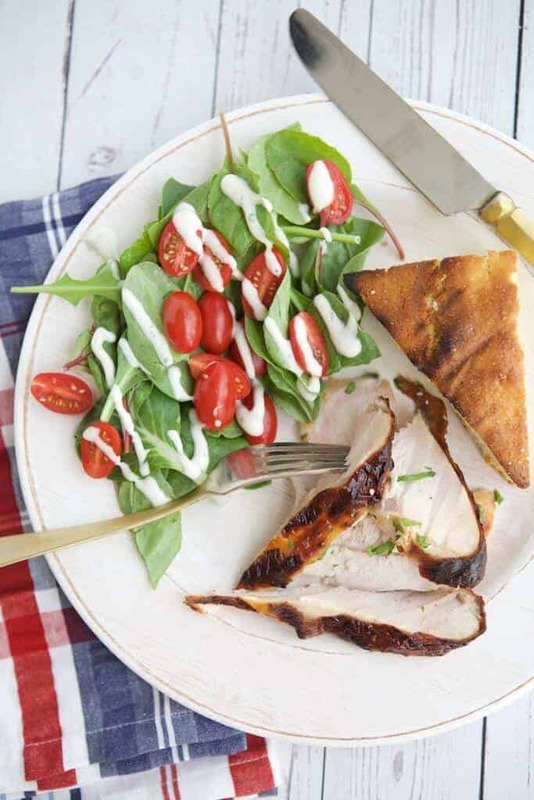 This Grilled Turkey Breast recipe is my nod to the wonderful turkey and how to enjoy it all year long. It’s just as easy as grilling any other type of meat, especially when you know the keys to success. 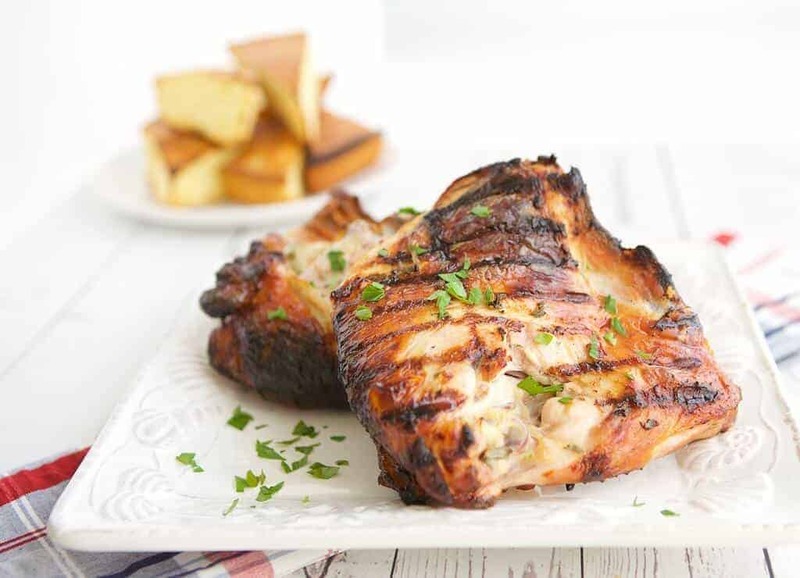 Here are some tips I learned while creating this grilled turkey breast recipe to ensure it turns out amazing for you. Getting your hands on any type of turkey throughout the year is a piece of cake at most grocery stores. I simply asked the butcher to order me fresh turkey breast halves and they were ready for pick up the next day. They didn’t cost anything more than they usually would. Each turkey breast cost between $8-10 depending on size and easily feeds 2 people. Since you have to grill bone-in turkey for a while to fully cook it, brining is an essential step to ensure it stays juicy and flavorful. Brining is simply marinating in a solution with a higher salt content. The salt allows water to flow into the cells and keep them hydrated throughout cooking. It also helps to flavor the meat. Turkey is super versatile and great at soaking up all the flavor of whatever marinade or seasoning it’s cooked with. 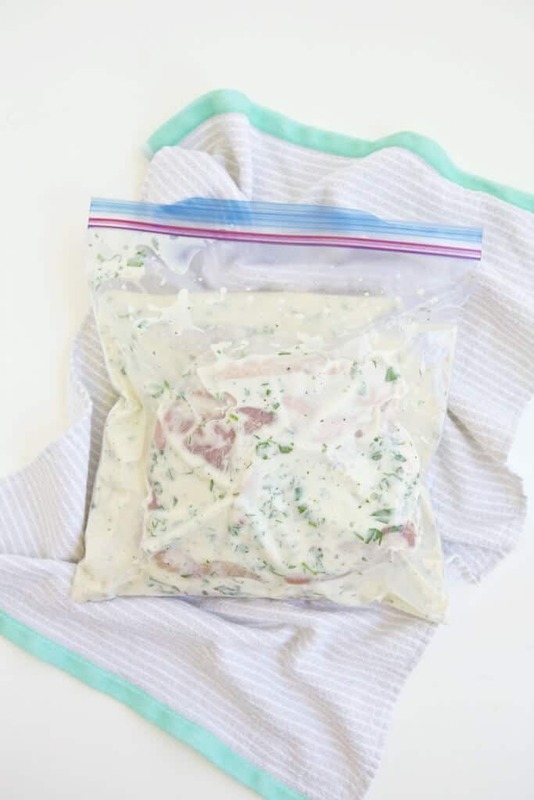 This brine-marinade is a killer combination of big flavors, perfect for summer: beer, yogurt, garlic, salt, pepper, and fresh herbs. 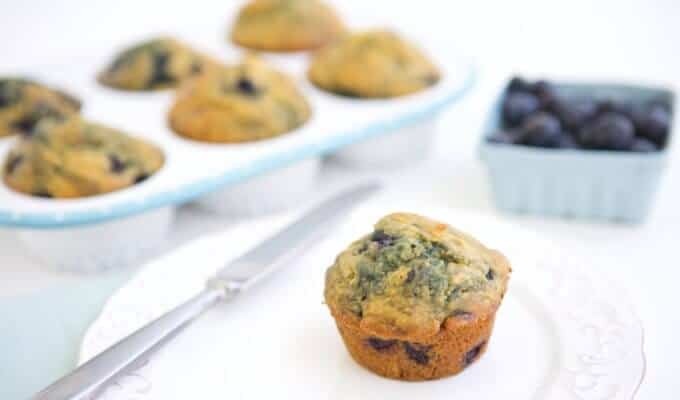 It’s very easy to make and packs in big flavor. In order to fully cook this turkey breast without burning it, indirect grilling is the way to go. This means you cook the meat on a part of the grill that is turned off. To do this, pre-heat your whole grill, then right before putting the meat on, turn off one burner. The side of the grill with the burner off is the side to cook your meat on. If your meat does not have a true flat side to grill, you may want to use a brick to hold it down. 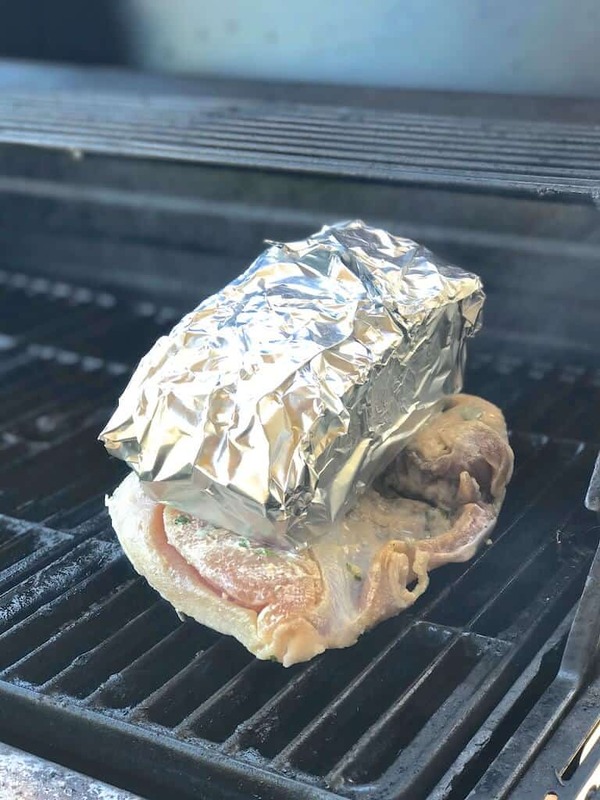 Simply wrap a brick with clean, aluminum foil, heat it in your grill while pre-heating, then place it on top of the meat. Make sure you have a good high heat glove or mitt to use to pick up the brick! I cooked this Grilled Turkey Breast recipe with and without a brick depending on the shape of the particular breast. I prefer using the brick in this recipe, but it’s not necessary. 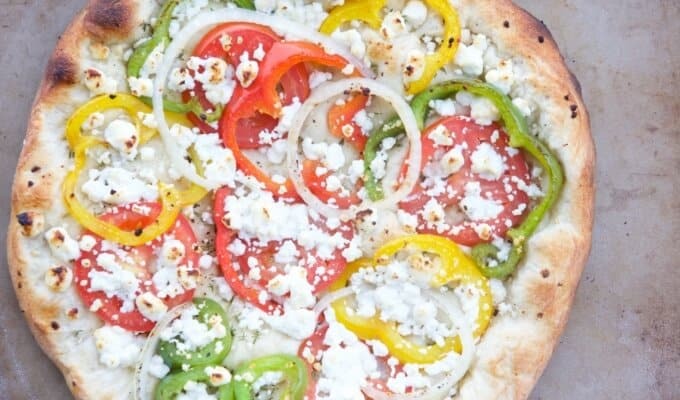 The cooking time for this recipe will vary somewhat based on your grill. Since we are using indirect heat, the temperature inside your grill will vary throughout cooking too. Play with the other burner settings (higher or lower) to keep the temperature around 450 degrees. You may be adjusting the flame knobs throughout the cooking time. I also noticed that the turkey can read significantly different temperatures in different spots. 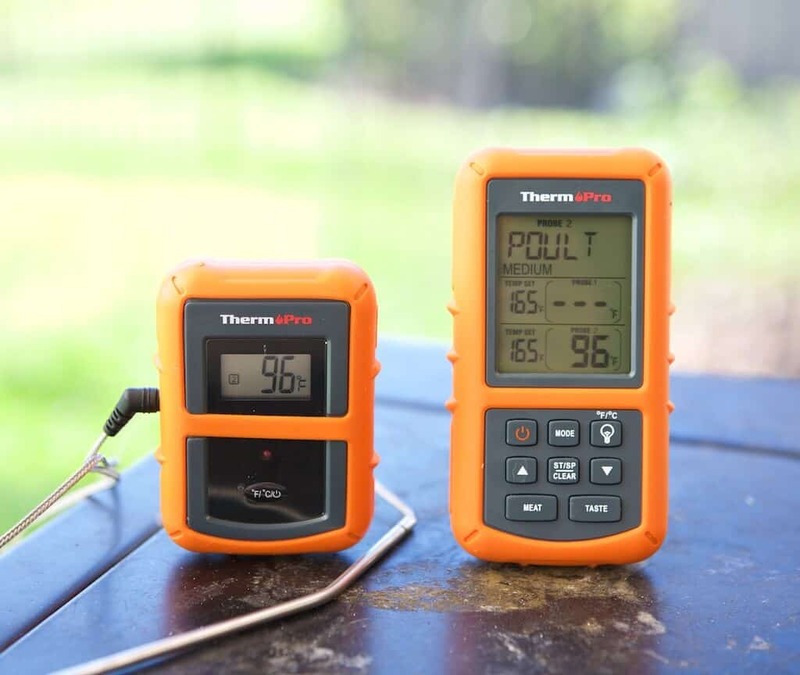 This is again why a high temp meat thermometer is so important for success. Roughly, a turkey breast should take between 30 and 45 minutes to be fully cooked and reach the recommended internal temperature of 165 degrees. Start taking the temp around 30 minutes in 2 different places on the meat, being careful to not touch the bone with the thermometer. If most of your readings are significantly less than 160 degrees, keep going in 5 minute increments. If you have readings that are high, more than 160 degrees in one spot, but in the 150 degree range in another, I pulled the meat off the grill. When you let it rest for about 15 minutes, the meat should finish rising to 165 degrees, which is the appropriate temperature to cook turkey to, without drying out. In a medium mixing bowl, whisk the salt into the beer until it dissolves. Then, whisk in yogurt, garlic, pepper, parsley and sage until well combined. 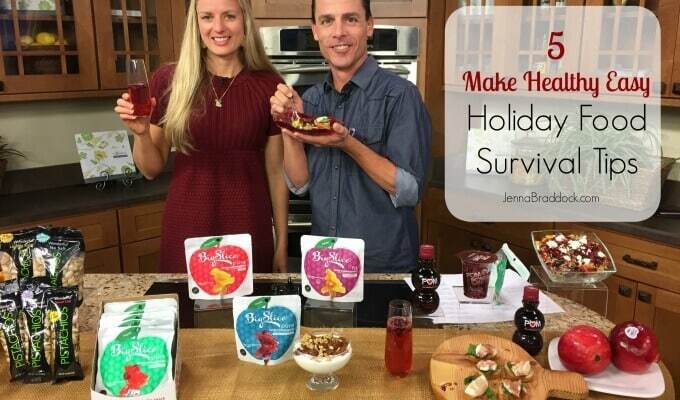 Put raw turkey breasts in a gallon size sealable bag and pour brine over it. Seal bag and rest it in a flat bottom dish, like a 8x8 pan. Put pan in the refrigerator and marinate for 8-12 hours, flipping the bag over at least once during that time. When ready to grill, take the bag out of the fridge. Remove turkey from brine and pat dry with paper towels. Let sit at room temperature while grill preheats. Discard brine. 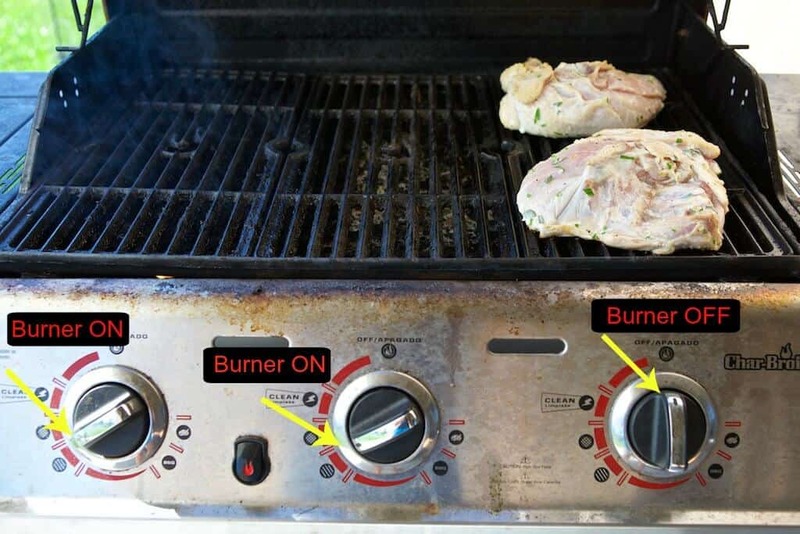 When grill is heated, turn off one burner, leaving at least one burner on. Spray or rub grill grates with oil on the OFF side only. Carefully lay turkey breasts on grill side with burners turned OFF, skin side down. Put on a heavy duty oven mitt and place the brick on top of the turkey breasts (this step is optional). Close the grill and let cook undisturbed for about 30 minutes. Check the temperature on your grill frequently and adjust level of the ON burner to keep grill temperature around 450 degrees F (likely you will have to turn the ON burners up to a hotter temperature). At 30 minutes, remove the brick while wearing the heavy duty oven mitt and turn the turkey breast over. Take the temperature of the meat in 2 places. Refer to suggestions above in blog post to determine the best time to remove turkey from the grill, likely when breast meat reaches 160 degrees. If temperature is still reading low, grill for 5 minute increments skin side up, checking the temperature each time. 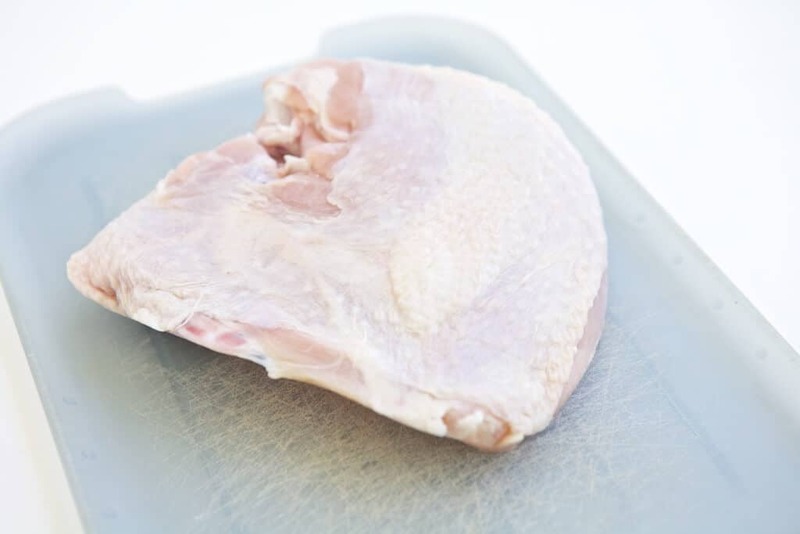 The brine can be used on any cut of poultry, bone-in or boneless, skin on or skinless. When I was working on this recipe, for some reason I just had cornbread on the brain to pair with it. My intuition proved to be right because it was a winning combination. 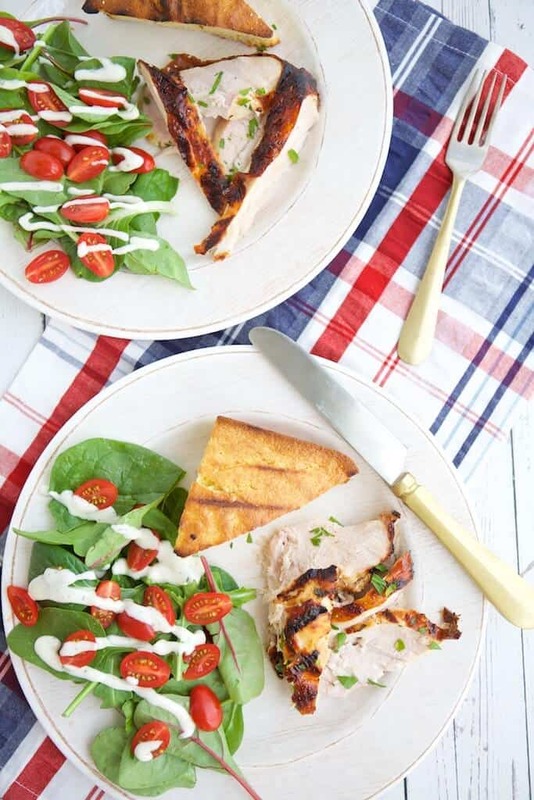 I highly recommend serving grilled turkey breast with a crisp summer salad and grilled, jalapeno cornbread. This cornbread could not be easier to make so don’t worry about another complicated recipe. I simply started with my favorite boxed honey cornbread mix, then folded in a diced, fresh jalapeno (I only used half of a pepper but you can use more if you really want to taste the kick). Bake according to the box directions. After the bread has cooled, cut it into triangles. 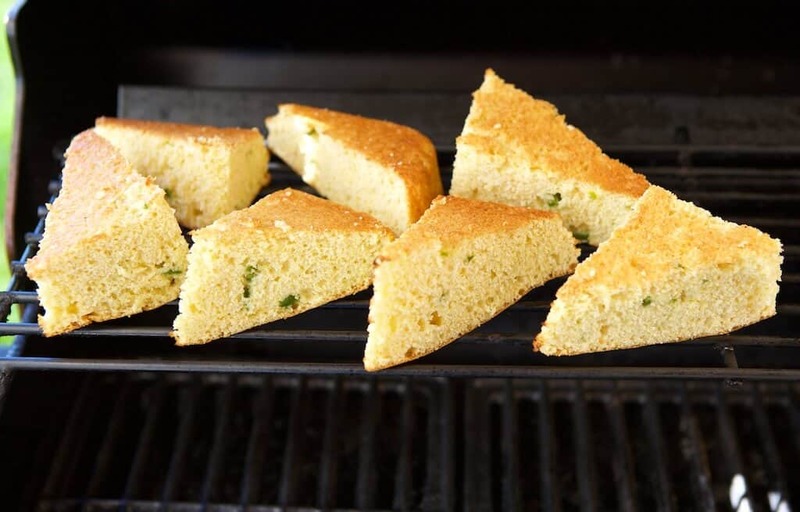 During the last 5 minutes of grilling the turkey, lay the cornbread triangles, top down, on the upper rack of the grill. Let it grill for 3-5 minutes, just until the edges brown a bit and grill marks appear on the bread. Remove from the grill and serve with the meat. I really hope you try this grilled turkey breast this summer. It will, for sure, break up the grilling monotony you might experience from time to time. And, if you happen to have any meat leftover, pick it all of the bone and freeze it for use in any future recipe that calls for cooked poultry. You can even try them in my All-Natural Enchiladas. I know, I know. It sounds super weird. It just adds a little sweetness to the brine without needing to add extra sugar. Just trust me. No vanilla flavor comes through. 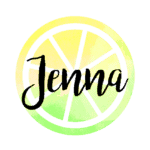 Love it all, Jenna! Can’t wait to try! I also just ordered this thermometer for Brent for Father’s Day!! I think he will love it!! Thanks Holley. 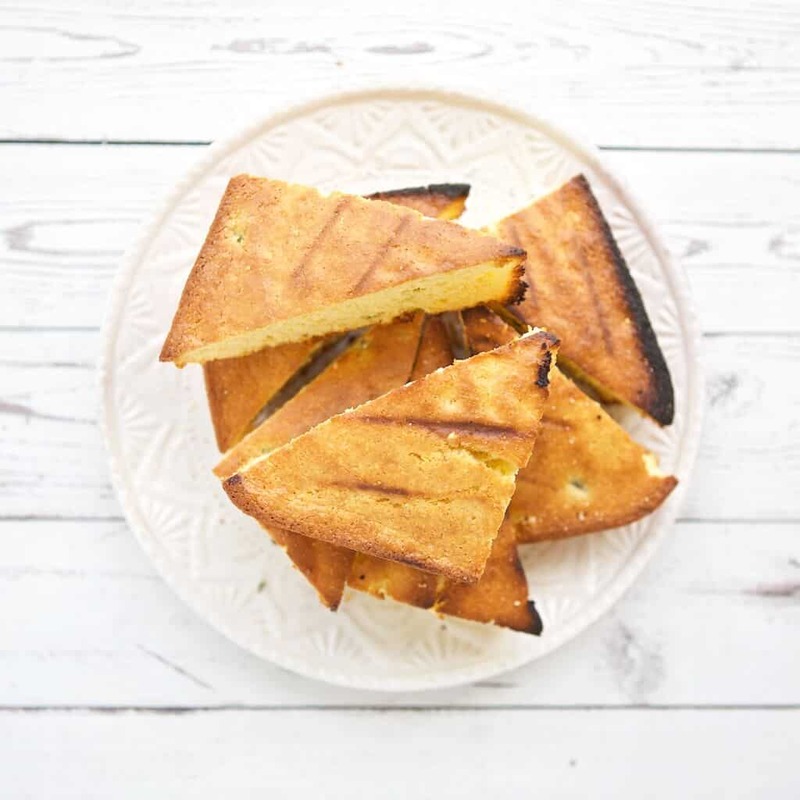 Love how you dressed up the boxed cornbread with jalapeno! Such a great hack! Thank you! It really jazzes it up. Enjoy! This is looks SO delicious!! 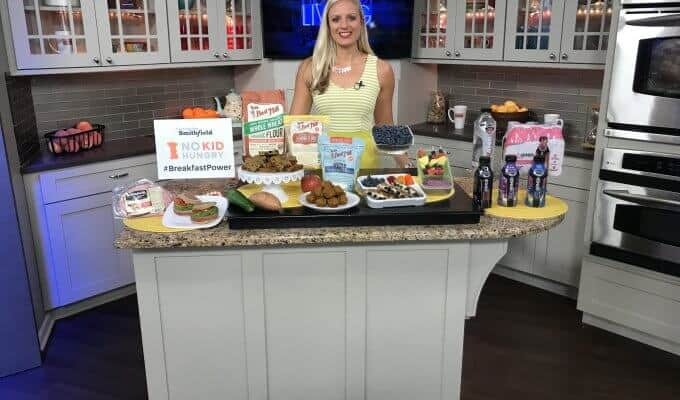 Hope you try it Katie!